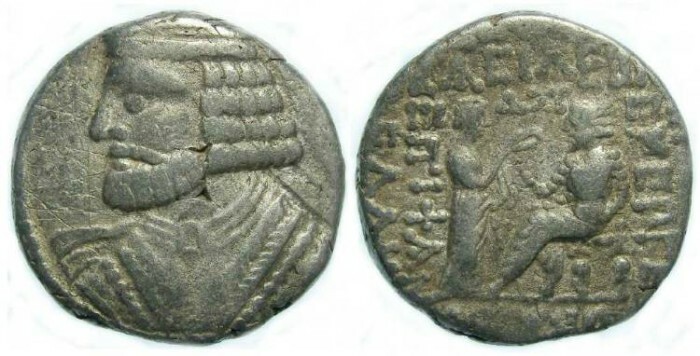 Parthia, Vologases I AD 52 to 52, Silver tetradrachm. Reference : Sellwood-680, Shore-370 var. Size : 26.2 x 26.7 mm. Weight : 13.97 grams. Grade : aVF, with some minor scratches and light graffitti in front of Volgases face. Obverse : Head of Vologases I left. Reverse : Vologases seated left on a throne, recieving a diadem from Tyche who is standing right. Assorted inscriptions around, with the date code DXT for year 364 between Volgase's and Tyche's heads.